Angel Otero, Untitled, Oil paint and oil paint skins collaged on canvas. Courtesy of the artist and Kavi Gupta Chicago Berlin. RALEIGH, NC.- CAM Raleighs latest Independent Weekly Gallery Emerging Artist Series exhibition by Angel Otero is a museum premiere of new works and the artists first solo museum exhibition. The exhibition, consisting primarily of new artworks including never-been-exhibited sculpture made from steel and porcelain, opened October 19, 2012. Although Oteros canvases and assemblages take cues from Georg Baselitz, Philip Guston, and Willem de Kooning, with a nod to the Spanish Baroque, he has also drawn on his familial relationships and life in his native Puerto Rico, which he left at the age of 24 to study at the School of the Art Institute of Chicago. Hes been always intrigued by process and initially came to his current technique by recycling paint in order to save money and resources while in art school. He would scrape the paint off works he was dissatisfied with and add it to a growing mountain of remnant oil paint. Eventually, he started to form the clumps into flower shapes and spray paint them silver, which on the canvas created the illusion of working with tin foil. For his new work, Otero has left behind any formal relationship he had with objects and is purely focused on stretching the limits of the material. Oteros approach has been attracting attention since his days at art school. Having honed his technique with confidence, he is able to keep experimentingboth with painting and his second love, sculptureproducing works that are meaningful in both appearance and form. Born in 1981 in Santurce, Puerto Rico, Angel Otero currently lives and works in New York City. Otero is a visual artist best known for his process-based paintings. While much of his works have been influenced by memories based in photographs and other family memorabilia combined with the gestures of 20th century painting, his latest works highlight the artist's unique process as a form of narrative in itself. Through his innovative process of oil paint scraping, Otero venerates historical oil painting technique while confronting it head on. 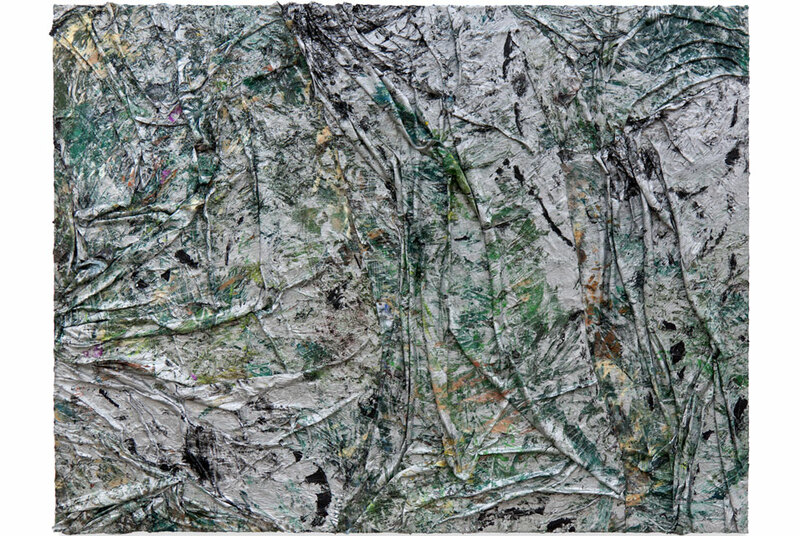 Oteros deformation approach to painting his works, first across glass and then once dry, flaying the dried paint and reconstructing the composition anew across large canvasses, is representative of how the artist perceives the process of reconfiguring both personal and historical narratives. Oteros work sometimes uses process as a way of confronting deep, personal memories. Instead of representing his life through art, he archives moments within it by creating opportunities of surprise and discovery. His work is a constant negotiation between the individual and art history. Otero received his MFA from the School of the Art Institute of Chicago. Recent exhibitions include Kavi Gupta Gallery, The Dangerous Ability to Fascinate Other People; El Museo's Sixth Bienal at El Museo del Barrio; Memento, a solo exhibition at Lehmann Maupin Gallery New York; Misericordia at Prism Gallery Los Angeles; Chicago Cultural Center; Constellations at the Museum of Contemporary Art Chicago; a solo exhibition at ISTANBUL'74, Turkey; and a solo exhibition in India at Gallery Isa, Mumbai. Otero is also the recipient of the Leonore Annenberg Fellowship in the Visual Arts.